Trial For Suspects Accused Of Stealing 220-Pound Solid Gold Coin Begins In Germany Prosecutors say the men pulled off the low-tech heist using a ladder, rope and a wheelbarrow. Police believe the $4.3 million coin has been melted down and sold in pieces. The men deny all charges. The "Big Maple Leaf" went on display at Berlin's Bode Museum in 2010. Thieves stole the gold coin with a face value of $1 million and weighing 220 pounds in a surprisingly analogue heist. The trial of four men accused of stealing a 220-pound solid gold coin worth an estimated $4.3 million from a German museum began in Berlin on Thursday. Prosecutors say three of the suspects crawled into the Bode Museum through a third story window using a ladder on an elevated train track located behind the building during the early morning hours of March 27, 2017. They allegedly smashed into a bulletproof case and grabbed the gleaming treasure, apparently ignoring all of the other precious coins around the room. Somehow the trio managed to haul their booty, which weighs as much as some refrigerators, out of the window. And they did it all without activating the alarm. "Once outside the museum, the thieves used a wheelbarrow to push their loot 100 meters down the tracks and across a bridge over the river to nearby Monbijou Park, where they dropped and most likely damaged the coin while abseiling to the ground," The Guardian reported. Three of the suspects are related — Ahmed and Wayci Remmo, 20 and 24 respectively, are brothers. Wissam Remmo, 21, is their cousin. The fourth suspect is a former museum guard who has been accused of helping the them. In court, Chief Prosecutor Martina Lamb "demanded that $4.31 million be confiscated from them, a price that corresponds to the sales value of the gold," according to Deutsche Welle. The men deny any involvement in the theft. 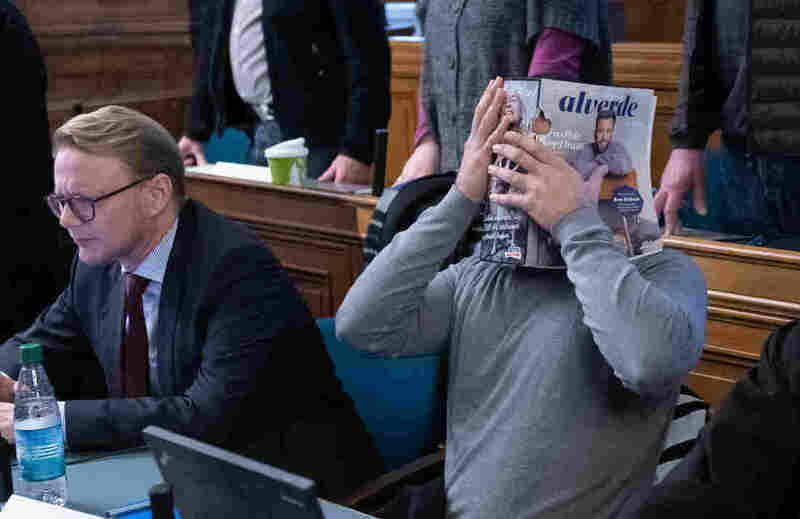 On Thursday, Toralf Nöding, a defense lawyer for one of the men, argued that police had presented "not a single shred of evidence" indicating they were behind the heist. Ahmed R. sits next to his lawyers at the start of the trial in connection with the theft of the gold coin "Big Maple Leaf" on Thursday. He and three other suspects, covered their faces in the courtroom. The whereabouts of the Canadian commemorative coin remain unknown. Police contend the Remmos melted it down and sold it in pieces. The "Big Leaf Maple," as the coin is called, is more than an inch thick and 21 inches in diameter. 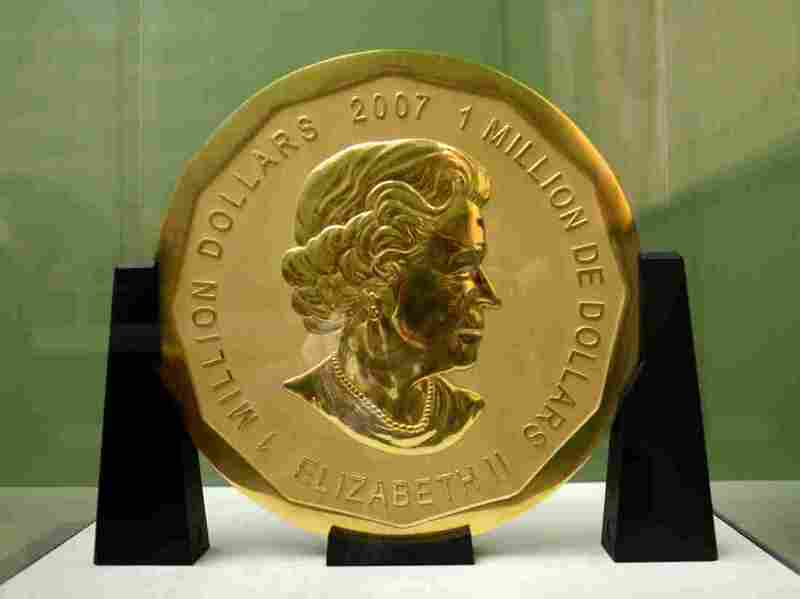 It is made of 24-karat gold, with a portrait of Queen Elizabeth II on the front and a giant maple leaf on the reverse. It was named the largest coin in the world by the Guinness World Records in 2007, although it has since been overtaken by one produced by Australia's Perth Mint. Although its face value is set at one million Canadian dollars – about $750,000 U.S. – market prices for the gold content of the mega coin hovered at about $4.5 million at the time it was stolen. "The story behind this big ball of bling begins back in 2007, when the Royal Canadian Mint was gearing up to release their latest series of bouillon coins. "The mint had achieved a milestone in the industry. They had developed the technique to create coins that were 99.999 percent pure, or 'five-nines' in mint-speak. The last time the Canadians had reached such a milestone was in 1982, when they produced gold that was 99.99 percent pure." "We created this coin as a one-off," Alexandre Reeves, senior adviser of external communications at the Royal Canadian Mint, told The Daily Beast. "It was meant to promote the line of one-ounce, five-nines pure gold bullion coins. But when we unveiled the million dollar coin, interested buyers came forward and they said, 'Well I'd like to have one of these coins for myself.' "
Five versions of the coin have been sold to private buyers around the world. The original was kept by the Royal Canadian Mint, which explained that it had created the impressive token, "Because we can." Police argue the three related men are members of the Remmo clan, a Lebanese crime family with a powerful stronghold in Berlin. Under a new anti-money laundering law passed in 2017, Berlin police conducted an extensive raid on Remmo family properties, seizing 77 houses worth about $11.5 million. According to Deutsche Welle, Nöding denounced reports that three men on trial are related to the Remmo crime family. If found guilty, all four suspects could face up to 10 years in jail.